The Coast Guard report, issued Sunday, blames the crab boat's owner and the captain for the 2017 disaster that unfolded on winter seas after ice built up on the hull and gear. 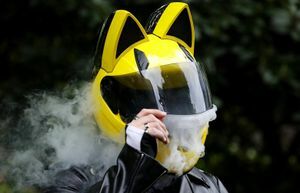 "The crew had very little time, if any, to react," investigators wrote. 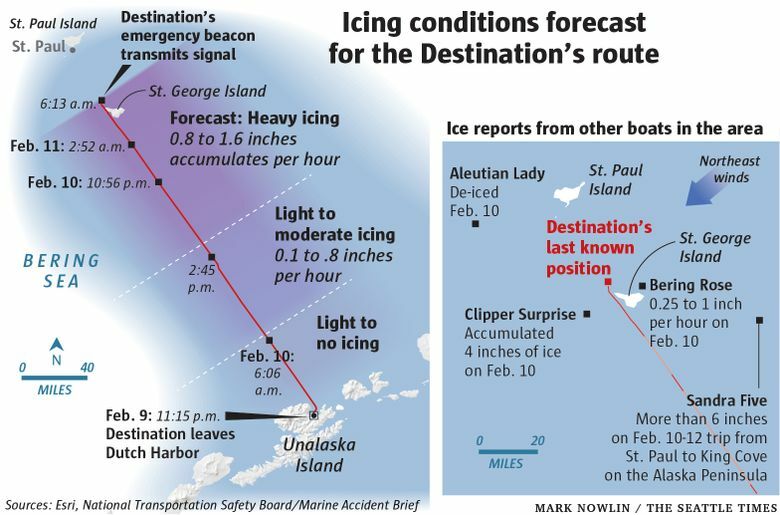 The Seattle-based Destination crab boat, on what would be its fatal voyage, set off into harsh, freezing spray in the Bering Sea overloaded, not up to stability standards and carrying a tired crew, according to a Coast Guard report released Sunday that blamed the boat’s owner and its captain for failing to ensure safety. 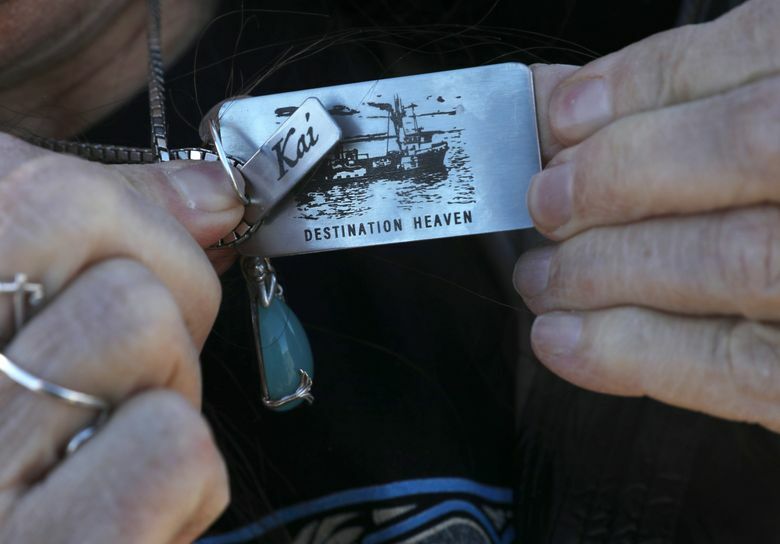 The Marine Board of Investigation detailed a series of missteps that led to the deaths of all six crew members on Feb. 11, 2017, while also uncovering weaknesses in a safety-oversight system set up to prevent such fishing-industry disasters. The Destination was “in a vulnerable condition” that left the crew “with limited ability to survive,” said Capt. 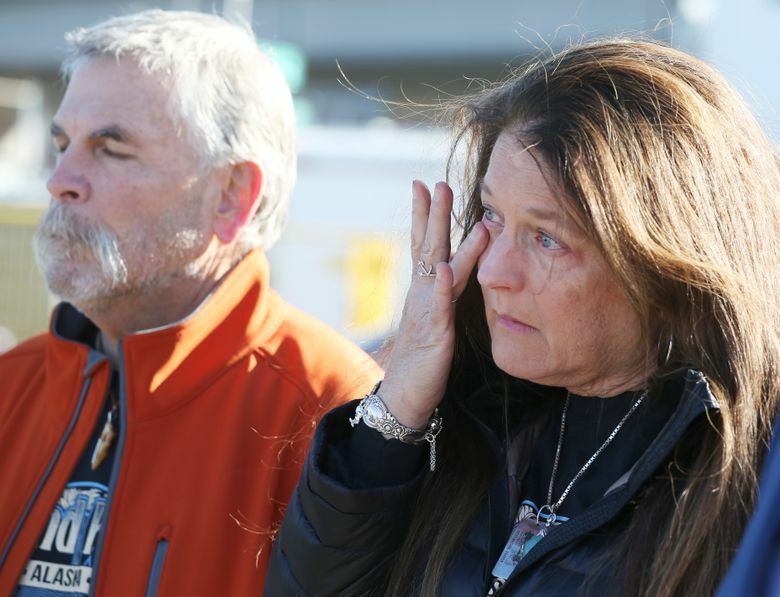 Lee Boone, director of investigations for the Coast Guard, during a Sunday news conference on the Seattle waterfront, as the parents of Kai Hamik, one of the men killed, looked on. The report was long-awaited “factual confirmation,” Tom Hamik said, of what he and his wife had long suspected — mounting pressure on the crew helped send the vessel to the bottom of the sea. • The Destination, when it left port, was overloaded and did not meet minimum stability standards required by a federal regulation. • The captain set out in freezing spray with a fatigued crew that failed to remove a heavy buildup of ice on the hull and gear. •A hatch was believed to have been left open, which would have allowed rapid flooding when calamity struck after 6 a.m., after the boat left the lee of an island and encountered rough seas. “It just wasn’t one thing,” Boone said. The Coast Guard commandant agreed with recommendations to increase emphasis on stability training among boat owners and captains, but decided against pursuing new safety regulations. The Destination capsized and sank “within a matter of minutes” leaving the crew “very little time, if any, to react,” according to the report. “It would be a challenge for any crewmember or fisherman to conduct emergency broadcast radio calls, don a survival/immersion suit and deploy the liferaft in this short period of time,” the report said. While sonar imaging found the Destination lying on its side on the ocean floor, the bodies of Captain Jeff Hathaway, Kai Hamik, Charles Glen Jones, Larry O’Grady, Darrik Seibold and Raymond Vincler have not been found. 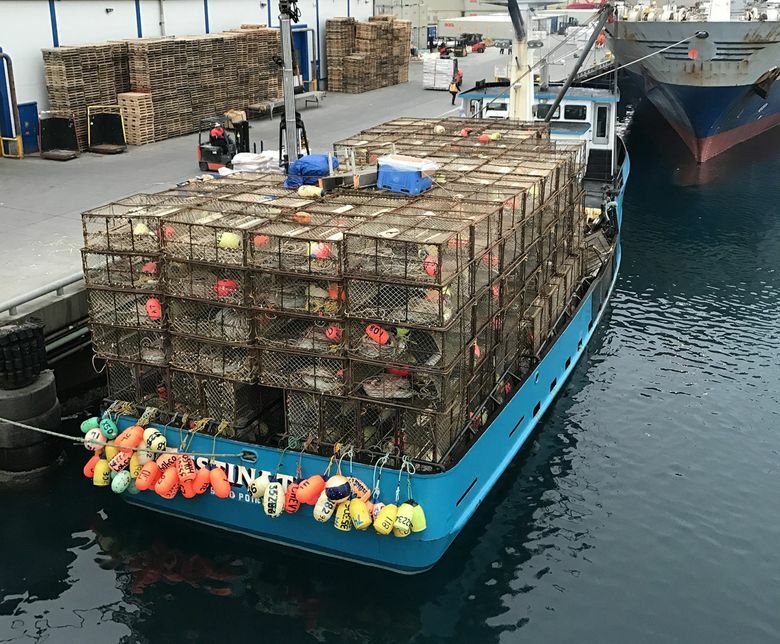 The sinking stunned many in the Bering Sea crab fleet, which had substantially improved its safety record from the 1990s, when the deaths of more than 70 crew members gave momentum to reforms. 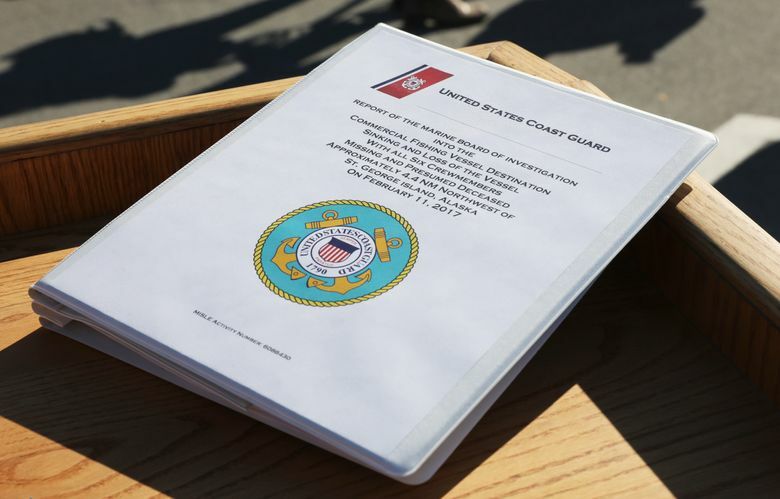 It prompted the Coast Guard to form the three-person marine board — the highest level of marine-casualty inquiry — to understand what happened and to make recommendations to advance safety. 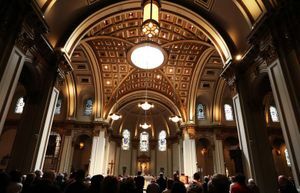 The document was made public Sunday after a private Saturday meeting that Coast Guard officials scheduled in Seattle for the families of the lost crew. The board found that the Destination’s problems resulted, in part, from a load of 200 crab pots that were heavier than indicated in an out-of-date 1993 stability booklet that offers crucial safety information about how to load the boat. The board recommended that the Coast Guard determine if civil penalties should be assessed against the boat’s owner for failing to provide the captain — as required by federal regulation — with accurate stability instructions. The boat was owned by Destination Inc., a company formed by David Wilson, who lives north of Seattle, and his brother Louis Bernsten. The alleged violations of the regulations will be referred to the Coast Guard’s Anchorage sector for a possible enforcement action, wrote Rear Admiral J.P. Nadeau, the Coast Guard’s assistant commandant. Officials do not plan to pursue a criminal case. “In this case, there was no evidence there was any criminal activity,” Boone said. The Seattle Times reached out to an attorney representing the owners for comment, and as of Sunday evening had not heard back. The report also says Hathaway, the captain, added to the stability problems by improperly putting bait atop the pots, which was not allowed in the loading instructions that also required the boat’s hatch to be secured. The findings led the marine board to make 15 recommendations. Nadeau accepted seven, partially concurred with two and did not agree with six. Recommendations Nadeau rejected called for updating federal safety regulations to specify the weight of crab pots and the risks of ice. 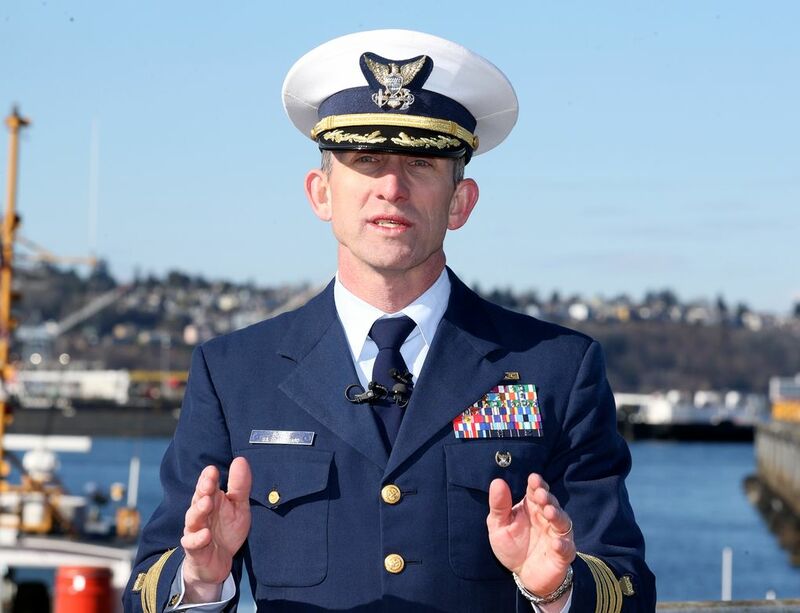 He also turned down recommendations that called for regulations to require boat owners to maintain records of weight changes to their vessels, notify the Coast Guard when major changes are made on a boat, and to require owners and captains to develop policies to address crew fatigue. And, Nadeau rejected a suggestion for a broader audit of the nation’s fishing fleets to look for stability problems that could put boats at risk. “There is not sufficient evidence in this report to conclude additional oversight is needed across the entire fleet of commercial vessels,” Nadeau wrote. Family members said their Saturday meeting with the Coast Guard was somber, at times tense, stretching from morning to deep in the afternoon. Some questioned why the Coast Guard would not pursue criminal penalties against the boat’s owners. “Six people lost their lives. This is just not right,” said Gayle Andrew, mother of Destination crewman Darrik Seibold. Search efforts recovered a life ring, debris and an EPIRB — emergency position indicating radio beacon — that gave off a distress signal when the boat went down. But there were no signs of the crew or the Destination’s life raft that was supposed to break free of the boat in event of a disaster and give the crew a chance of survival. The marine-board team said there was not enough evidence to determine if the raft launched properly. “Where’s the life raft? Why did the life raft not go off?” said Judy Hamik. The National Transportation Safety Board also investigated the accident, releasing a report in July that found the accident was caused by Hathaway’s decision to head out in hazardous conditions, and then — once at sea — failing to have the crew combat the ice buildup that helped make the boat disastrously top heavy. Hathaway was a veteran captain who had served on the Destination for 23 years, and he had an experienced crew who — after a long season catching cod — were getting a late start on the crab season. His boat was scheduled to deliver crab to a processing plant on the Pribilof Island of St. Paul. And, in radio communications with another skipper, Hathaway was concerned it would be hard to catch the boat’s quota by a Feb. 25 plant shutdown. Dylan Hatfield, a former Destination crewman who lost his brother, Darrik Seibold, and close friend, Kai Hamik, in the sinking, still has questions about what happened that early February morning.